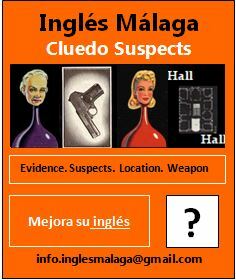 Inglés Málaga Cluedo Suspects is a murder mystery game which will help improve your English speaking skills. You will practise asking and answering questions, improve your vocabulary, develop fluency and self-confidence, and ensure that at least one murderer is off the streets of Málaga. Do you have the investigative skills, deductive powers and linguistic abilities to work out the clues, solve the murder, and prove your innocence? If you think you’ve got what it takes to be an Inglés Málaga Cluedo Suspect, and you want to improve your English communication skills in an entertaining way, then, why not take part in the Inglés Málaga Cluedo Suspect event? Number of participants: Between 3 and 4.